Microsystems for Bioelectronics is the ultimate guide in the biomedical application industry. It provides a physics-based assessment of the limitless potential of miniaturization technologies. This book goes far beyond the complete design of the final systems. It also discusses the developments of computation and communication subsystems. The future of this technology lies in understanding the scaling limits for the individual systems. This includes all of its components and the fundamental energy source that powers all autonomous microsystems. Rapid advances in microfabrication technologies are offering new opportunities and capabilities to develop systems for biomedical applications. These applications include the diagnostics community and those that are active in therapy services. 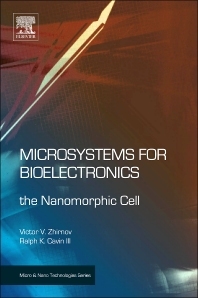 Microsystems for Bioelectronics is one of the only books on the market today that goes into the comprehensive treatment of integrated microsystems. Practicing engineers and scientists who are involved in research and development for integrated microsystems, including biolelectronic and biomedical devices. Research Associate Professor at North Carolina State University and has an appointment as research scientists at the Semiconductor Research Corporation (SRC). His responsibilities at the SRC include assessments of emerging nanoelectronic devices. He has authored and co-authored over 80 technical papers and contributions to books. He has served as a consultant to a number of government, industrial, and academic institutions, and was awarded the Springer Prize as well as the Arthur K. Doolittle Award.